It would be a major accounting faux pas if I were to neglect writing about the “Father of Accounting”, the “Sultan of Cash Flow Statements”, the “Gangster of Love” in my series of Great Moments in Accounting History posts. I, of course, am referring to Bob Newhart. 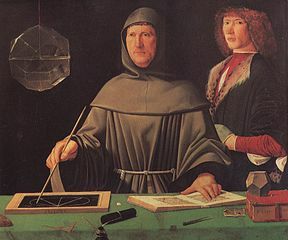 Actually I’m talking about Luca Pacioli who has been credited with creating the double-entry accounting system way back in 1494, which, by my calculations, means that those of us in the accounting field have been forced to do twice the amount of work for the last 1,000 years or so (I’ve never been very good with numbers). Despite lacking the sense of humor of a Bob Newhart I can honestly say that it gives me chills knowing that what Good Ol’ Luca accomplished in the accounting world all those years ago has, in some small way, led to me sitting here in my cubicle* typing a blog post about him while eating deep-fried M&M’s wrapped in deep-fried bacon. *Disclaimer – No actual writing of this post was performed during work hours (or any other time of the day for that matter). Your title alone is enough to make me crack up. I’m sending this to all my accountant friends. He’s going to love it. Thank you for the comment my friend. I hope your accounting friends enjoy it but if they don’t I place the blame squarely on Luca (not to be confused with Luka; I think she’s been through enough).